Bournemouth XI: Boruc, Francis, Cook, Distin, Daniels, Smith, Gosling, O'Kane, Surman, Ritchie, Murray. Who needs Sergio Aguero eh? Fine display from Manchester City, who have a little matter of the Manchester derby up next. "Bournemouth have not been able to handle Wilfried Bony's strength today. And that goal typifies the way he has played. He rolled the defender and curled the ball into the corner. All done at his pace." All over at the Etihad. Raheem Sterling announced as the man of the match and deservedly so. Kelechi Iheanacho is clean through for City and chips over Adam Federici wonderfully but it is disallowed for offside. Replays show that the referee's assistant was wrong. Wilfried Bony grabs a second and owes a huge amount to Jesus Navas, who took the ball half the length of the field before crossing for the Ivorian. The stadium announcer announces that the attendance is 54,502, a new record for the Etihad. Charlie Daniels cross from the left and Joshua King looks to have a clear shot on goal but Eliaquim Mangala somehow manages to hack clear. Another smart set-piece from the Cherries, which eventually leads to Dan Gosling firing way over from distance. Simon Francis gets to the City byline down the right but his cross to the edge of the box finds no-one. The Bournemouth right-back has had a decent game going forward. No more goals for Raheem Sterling, who makes way for Kelechi Iheanacho. He is saluted by deafening applause, and rightly so. Marc Pugh replaces Adam Smith for the Cherries. You get the feeling that Bournemouth would be happy if the scores stays just the same as it is. No real thrust from the visitors now. Bournemouth goalscorer Glenn Murray is off and replaced by Norwegian international Joshua King. Nicolas Otamendi tries to find Raheem Sterling through the middle but Bournemouth defender Steve Cook covers well. Bournemouth's Glenn Murray climbs to reach the deep cross but Joe Hart out-leaps him and gathers at a second attempt. Simon Francis makes inroads down the right for Bournemouth and wins a corner. Matt Ritchie over it. Bournemouth now make a change. Shaun MacDonald on for Eunan O'Kane. But in fact, City have only played five crosses in open play, all from the left, and none of them have found their target. City even played their one corner of the game short - when they get near the Cherries area they try to pass through the visitors' defence instead. Chance for City and it's Raheem Sterling who goes close again. Wilfried Bony wins it outside the box, squirms the ball through to Sterling, who pokes it wide of goal. Kevin de Bruyne is replaced by Samir Nasri. Bournemouth will be pleased. Raheem Sterling is through on goal after being set free by Wilfried Bony, but he wastes the chance and shoot into the side netting after the Bournemouth defenders recover. Raheem Sterling not as sharp from outside the box on this evidence. The City forward has time and space to shoot from 25 yards but it's way, way over. At the other end, Charlie Daniels crosses from the left for the Cherries but Dan Gosling's header is well wide. Kevin De Bruyne feeds Jesus Navas, who crosses low to Wilfried Bony but the Ivorian shoots straight at Adam Federici. Let-off for Bournemouth. Half-chance for Glenn Murray, who collects a knock down following Joe Hart's goal-kick. But the shot from the Bournemouth is dragged wide. Bournemouth build well down the right but when it is switched to the left Matt Ritchie mis-controls it and City are away again. Fortunately for the visitors Andrew Surman shows a lot better composure in his own box to end the attack. City's Bacary Sagna takes a knock from Simon Francis, but is back up on his feet. Just as well given City's shortage at left-back, which is where the Frenchman has been playing today. Bit of a lull in the game now. It's won, as far as City are concerned, they don't have to force it. Next move is down to Bournemouth. And here he is. Kevin De Bruyne plays in Raheem Sterling down the left, and although the cross is too deep, Pablo Zabaleta collects the ball and fires in a stinging shot which Adam Federici claws away. Kevin De Bruyne knows when to make his move inside, and link with others. He plays football very simply, but isn't that what all the best players do? Little bit rusty from Bournemouth as they concede possession in midfield. City are working it down their left, which, funnily enough, is where Kevin De Bruyne has been lurking for most of the game. City get us under way again. One change in the City midfield as Fernando replaces Yaya Toure. Ruthless from Raheem Sterling, who has had a busy half in the Bournemouth penalty area. He's had three shots and has three goals. Sergio Aguero scored five when they beat Newcastle 6-1 two weeks ago. Can Raheem Sterling match him? If Bournemouth defend like that in the second half, you can't rule it out. "Kevin de Bruyne has had a simply wonderful first half." And that's it for the half. Breathless stuff and Raheem Sterling absolutely beaming. Hat-trick for Raheem Sterling. A mistake by Andrew Surman lets Jesus Navas straight in on goal. But the Spaniard takes on Adam Federici and makes a pig's ear of it before the ball finds its way to Sterling who smashes under the hapless Federici. Dan Gosling breaks free for Bournemouth the release the pressure on their goal and wins a free-kick. Kevin De Bruyne has such a clinical right foot. He smashes a shot from the edge of the box, but Adam Federici tips it onto the bar. Great football. City might be ahead, but there's been plenty of action in both penalty boxes and Bournemouth have been the most active in their opponents' area. Nicolas Otamendi goes into the book as he scythes down Charlie Daniels. The free-kick is headed clear by City. City looking confident as the half comes to a conclusion. Another Bournemouth goal would change the game's complexion at the break. Four goals for Raheem Sterling for Manchester City this season. He certainly seems to be benefiting from Kevin De Bruyne's help. The Belgian now has three goals and three assists in his four Premier League starts. "I think Kevin De Bruyne is going to be King of Assists this season. "But what we are seeing from Sterling at Man City is what he was missing at Liverpool last season - when he carries the ball into the box he's now got the confidence to finish." Glenn Murray fires in another low cross for Bournemouth but Joe Hart gathers and throws it out to Kevin De Bruyne, who is a constant outlet for City. The Belgian collects again further upfield but his cross towards Wilfried Bony is headed away. "It's Raheem Sterling's goal but Kevin De Bruyne's pass was incredible. The weight on a ball like that, to get it just right it's such a difficult skill to pull off. "Sterling had the composure to finish it off, one-on-one with the 'keeper." Bournemouth's Matt Ritchie whips it into the near post. Nicolas Otamendi clears for a corner, which Yaya Toure subsequently heads away. Frantic half, so far. Christian, Kent: Poor Adam Federici will be made scapegoat today but let's face it Bournemouth were in for a premier league lesson today no matter who was between the sticks. Bournemouth will not be downtrodden. They win a free-kick deep in the City half. Andew Surman delivers but Eliaquim Mangala heads away. Great goal. Kevin De Bruyne finds Raheem Sterling, who races clear, and although the Bournemouth defence retreat well, the City forward puts two defenders on their bums and slots it into the bottom corner. Bournemouth like their cheeky set-pieces. This time they work a short free-kick with City defender Nicolas Otamendi stopping Matt Ritchie, who was on the charge deep in the City penalty box. Cherries fans in full voice, as you might expect. Raheem Sterling lifts it into Wilfried Bony, but he's just offside. That's made a game of it. Glenn Murray heads towards goal from a deep cross but it's over. Fine strike this. Glenn Murray collects it 25 yards out, advances towards goal and smashes it into the bottom corner. The ball took a flick off Eliaquim Mangala on the way in. Yaya Toure, back in the side today, absolutely smashes a pass out towards Raheem Sterling. Not sure how he was supposed to control it but the sheer venom of the pass drew praise from the crowd. Party pieces already? Raheem Sterling is on the charge again for City. He lays it back to Kevin De Bruyne, who smashes a shot towards Adam Federici's near post but the keeper palms it wide. "We're 12 minutes into the first half and Bournemouth are two goals down, away from home. At half-time players will look at their keeper and will wonder how many more of those are going to happen. It was going to tough enough today at City - you don't need a two goal deficit. "How many will Man City score today now? Six, I reckon." This one is deeper and leads to a Manchester City counter attack. The ball is crossed into City's Raheem Sterling but Charlie Daniels blocks his effort. The wind knocked out of Bournemouth as Eddie Howe discusses tactics with his assistants. But they have won a corner, which they play short and win another. "I wouldn't mind 20 of those a season! Adam Federici got to the cross first but he dropped the ball and it's a tap in for Wilfried Bony. Chocolate wrists. "That's exactly what Bony needed to get back in among the goals. City will be score at least four today." Not the start that Adam Federici would have wanted by any means. Remember that he only came into the side after Artur Boruc was injured in the warm-up. And let's not talk about last year's FA Cup semi-final! Terrible mistake by Adam Federici. The ball is crossed from the left by Bacary Sagna and Federici spills it at the near post, which Wilfried Bony gratefully gobbles up. Bournemouth might have a case there. Raheem Sterling looked a touch offside when Wilfried Bony poked it to him. There was a Cherries defender further forward, but he looked off the pitch. Bournemouth are protesting thatRaheem Sterlingis offside, but the goal stands. The ball is clipped to Pablo Zabaleta on the right wing, he clips it back to Wilfried Bony and Sterling skips in at the back post to poke in. Bournemouth work it nicely towards the City goal and once Matt Ritchie's shot is blocked it finds its way to Dan Gosling, who falls under a challenge from Nicolas Otamendi but referee Mike Dean is not interested. City under the cosh there. Little bit dicey from Eliaquim Mangala, who receives the ball from Joe Hart but squeezes between two Bournemouth attackers. Plenty of noise inside the Etihad as Raheem Sterling has a couple of early touches but makes no headway into the Bournemouth penalty area. Good possession from the visitors to start with. Kevin De Bruyne starts on the left of a three behind Wilfried Bony. 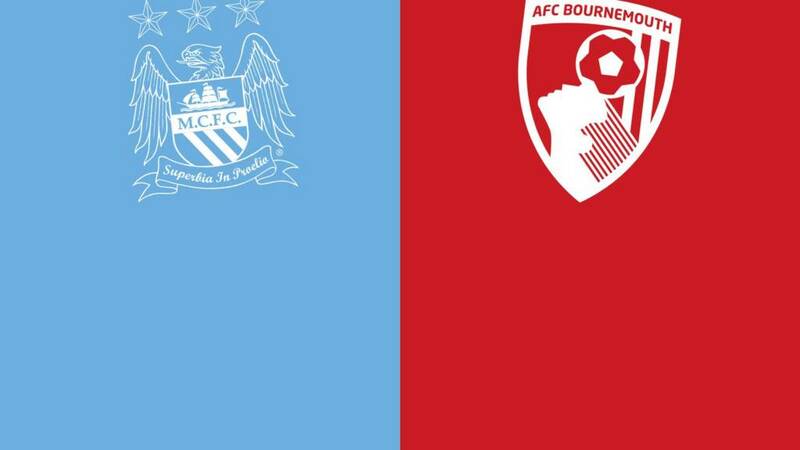 Bournemouth get us under way. The teams are out and everyone conducts a minute's applause for the sad passing of former City boss Howard Kendall. A late and unexpected change for Bournemouth as Artur Boruc injures himself in the warm-up. Adam Federici will make his Bournemouth league debut in his place, and the Cherries have no back-up keeper on the bench. You may have heard that former Everton boss Howard Kendall has sadly passed away and was of course, a Manchester City manager between 1989 and 1990. The club has already shown their respect by laying a wreath outside the stadium and will salute him with a minute's applause before the game. The players will also wear black armbands. Manchester City boss Manuel Pellegrini shuffles his pack after a string of injuries with Wilfried Bony in for Sergio Aguero and Jesus Navas in for David Silva. Yaya Toure is also back in the team, but captain Vincent Kompnay is on the bench, despite playing for Belgium on Tuesday. Bournemouth manager Eddie Howe makes two changes as Adam Smith and Euan O'Kane come in for Marc Pugh and Joshua King. The game comes too soon for midfielder Harry Arter, who is returning from injury and not in the squad. "It is scary, the amount of serious knee injuries that have been sustained in the season so far. Is it pitches, or the boots? Bournemouth's major injuries to their key players will make their Premier League survival battle twice as hard." Alas, Bournemouth's pockets are not so deep, and after knee injuries this season to Callum Wilson and Max Gradel, plus Tommy Elphick's ankle problem, boss Eddie Howe says: "We will have to be at levels we haven't been at this season. If everyone is at their maximum, we are in with a chance of getting a result." Fresh from signing a new contract this week, Howe will be earning his corn if he can pull this one off. De Bruyne worthy of Silva? At times like these for Manchester City, Kevin De Bruyne has proven a very wise buy, particularly in David Silva's absence. The 24-year-old Belgian international might have cost £55m, but he is fitting in very nicely at Manchester City and scored twice while on international duty. With the cost of Manchester City's squad estimated at £361m, more than eight times more than Bournemouth's at £41.83m, you might expect that the City slickers will be able to manage. But has anybody been watching the cricket? This afternoon's match is almost as much about who is not playing at Etihad Stadium, rather than who is. Manchester City's star performers Sergio Aguero and David Silva are injured, while Bournemouth skipper Tommy Elphick joined the Cherries' crocked list, which also includes top scorer Callum Wilson.